ProSupps Hydro BCAA is a a dietary supplement which was designed for physically active people who want to provide branched-chain amino acids BCAA in the best proportion 2:1:1. BCAA increase muscle protein synthesis (MPS) and inhibit catabolism responsible for muscle protein breakdown (MPB). Moreover, the supplement has been enhanced with essential amino acids EAA, which, next to BCAA, are necessary for anabolism, and minerals responsible for the proper water level in cells and muscle contractility. Branched-chain amino acids BCAA include L-leucine, L-isoleucine and L-valine. All of them belong to essential amino acids which need to be provided with food. L-Isoleucine ‒ has a similar name and chemical structure to the above described amino acid. It is responsible for increasing the uptake of glucose in the muscles, thanks to that you can perform more intensive workout. Moreover, as a glucogenic amino acid, it can be converted into glucose and fuel for the muscles, which protects muscle fibres from breakdown, (or muscle catabolism). L-Valine ‒ increases insulin activity as well as promotes anabolism and regeneration of damaged tissues. The amino acid increases muscle glycogen resynthesis and can delay the occurrence of fatigue during exercise, as it inhibits the activity of tryptophan, a substrate for serotonin production. These amino acids support muscle mass building and glucose metabolism, thus ensuring the proper energy level during training and faster post-workout regeneration. However, BCAA are not able to replace other essential amino acids (EAA), which is why the manufacturer has put some of them into the supplement. Synergistic action of amino acids stimulates the synthesis of muscle protein, which promotes the growth of muscle fibres. L-Threonine ‒ an amino acid which supports the absorption of nutrients from the digestive tract and participates in the synthesis of muscle protein and collagen. Moreover, it delays the occurrence of fatigue and is essential for the proper functioning of the nervous system, because it is involved in the transfer of information between synapses. L-Phenylalanine ‒ a trace amine which participates in the synthesis of neurotransmitters, such as dopamine, adrenaline and noradrenaline. It promotes concentration and suppresses pain, so that you can perform a more intensive workout. The amino acid can also be a substrate for production of thyroid hormones, triiodothyronine (T3) and thyroxine (T4), which are responsible for the metabolic rate of the body. L-Lysine ‒ participates in the synthesis of an anabolically strong growth hormone, which affects the rate of muscle protein synthesis. Lysine promotes restoration of tissues, increases collagen synthesis and absorption of calcium in the bones. Moreover, it inhibits the enzyme, collagenase, responsible for the breakdown of collagen and increases insulin secretion, thus promoting regulation of blood sugar level. L-Histidine ‒ facilitates the transport of oxygen in the body system, by stimulating the production of haemoglobin, and participates in the production of carnosine which increases contractility of muscles. The amino acid supports also formation of white blood cells responsible for immunity. Moreover, the minerals contained in the product increase hydration of muscle tissue, improve nerve conduction and muscle contractility, which positively affects the training process. Calcium ‒ is involved in muscle fibre contraction (including cardiac muscle) and regulates nerve conduction. It ensures the proper bone density, regulates the pH-balance of the body system and participates in the transport of nutrients. Moreover, it supports the functioning of the parathyroid glands and promotes fat loss. Magnesium – participates in the production of energy in the body system and increases efficiency by optimizing the use of oxygen in muscle tissue. It supports calcium building into the bone structure and determines the proper functioning of the nervous system. Sodium ‒ a chemical element necessary to maintain the proper hydration level. It protects from dehydration caused by intensive effort. Lost with sweat, sodium protects muscles from involuntary contractions and ensures the proper stimuli conduction in the nervous system. Potassium ‒ an element that facilitates the flow of nutrients into the cells, which can protect from the loss of muscle mass. Potassium regulates blood pressure and facilitates the use of glycogen in the muscles. It also regulates cardiac muscle contractility and protects from myocardial infarction. 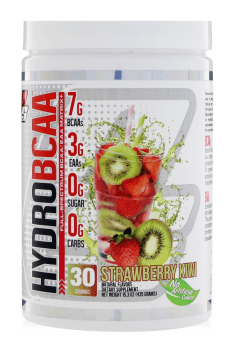 To sum it all up, ProSupps Hydro BCAA is an advanced formula of amino acids, containing high doses of BCAA and EAA as well as minerals to support the functioning of the body system during physical effort. The product protects muscle tissue from catabolism, promotes anabolism as well as increases the efficiency of the body by providing it with the ingredients necessary to maintain the proper nerve conduction and the contractility of tissue muscle. It will be perfect as a pre-workout supplement, but it may also be used after a workout in order to support the regeneration of connective and muscle tissues. Mix 1 scoop (14.5g) with 240-300 ml of cold water, use before, during or after training. The supplement can be used before, during and after training, both by people who are on reduction to protect muscle mass and by those who want to gain weight due to its anabolic properties. Before training, the product can be effectively combined with nitric oxide boosters (arginine and citrulline) and stimulant (caffeine and teacrine). Store in a dry and cool place, protect from light, moisture and high temperature. PRO SUPPS - these are very high quality supplements for athletes. The offer includes, for example, multi-component pre-workout supplement, providing increase of energy and faster building of muscle tissue, as well as supplements that increase testosterone production. The PRO SUPPS also have the purest form of glutamine, which has anabolic and anti-catabolic effect, support the immune system and accelerates regeneration. Citric Acid, Natural Flavors, Sucralose, Silicon Dioxide, Fruit & Vegetable Juice Powder (for color), Acesulfame Potassium. Not containt artifical Colors or Dyes. Vegan, gluten-free porridge enriched with proteins derived from soy and pea. Free of sugar. Chocolate enriched with whey protein. Tastes like traditional chocolate and is much lower in calories. The complex of ingredients, universally promoting energy level. It increases effort abilities and strength. Maximum concentration of beta-alanine (as much as 2,000 mg per portion). Supplement with beta-alanine, L-histidine, sodium, and vitamin B6. Reduces fatigue, allowing longer workout. BCAA are three essential amino acids having a side branched aliphatic chain (isoleucine, leucine, and valine) and a similar course of metabolic processes, occurring in the muscle tissue. In its natural form, they are found in high-protein animal foods (i.e. beef, milk proteins). BCAA have the anti-catabolic and anabolic potential. They support energy carriers during the energy crisis and affect the functioning of the nervous system (eliminate stress, reduce fatigue), hormone activity and kinases, which are responsible for the metabolism of proteins. In the sports supplementation they are used as supporting elements of exercise capacity (strength and endurance) and post-workout recovery; also as anti-catabolic and catalyst of anabolic changes. Taking BCAA after exercise almost immediately restores the levels of these amino acids in the blood (excluding liver) and supplies the muscle tissue. Leucine activates of mTOR kinases (starting anabolism of muscle proteins) and has the intensified effect with insulin, which acts on the PI3-kinase and protein kinase B. Branched amino acids chain BCAA, willingly used by strength, strength-endurance and endurance athletes, they are available in the form of single-component supplements, and advanced amino acid supplements, creatine, pre- and post- training stacks, and isotonic drinks. Dosage: usually 1-2 grams of BCAA per 10 kg of body weight per day. Mainly before and after training. Leucine is an essential amino acid, one of the three branched chain amino acids, ketogenic, its isomer is isoleucine. It affects the secretion of anabolic hormones (insulin, combined carbohydrates), acts on enzymes (mTOR) starting the process of muscle protein synthesis and controlling its course. Protein synthesis by leucine is affecting the development of bones, muscles and skin. It reduces the fat tissue. Without the availability of leucine, protein synthesis is impossible. It naturally occurs in animal products (such as eggs, meat, dairy and fish), plant origin, and as a post-training supplements, BCAA, EAA, no-boosters, creatine stacks, carbohydrate supplements. Ir is also in the form of mono-preparation supplements. It is one of the most important amino acids for the athlete's body, basically in every sports discipline. Dosage: The demand is 5-10 g / 24h, dosage pre- and post-workout and in the morning after waking up. Isoleucine is an essential branched amino acid (BCAA), leucine-isomer. It has anti-catabolic action ( protects muscle against decay), glucogenic (an alternative energy source when the level of glucose after exercise decreases, helps for the regulation of blood glucose levels, reduces the deficiency of fatty acids), anti-catabolic (muscle protects against decay), reduces stress. It participates in the synthesis of proteins (including the synthesis of hemoglobin). It is an essential part of the regeneration of damaged tissues of the body, and after intense training. It occurs in products containing animal protein (meat and dairy products, eggs, dairy products) and plant (almonds, walnuts) and dietary supplements. Isoleucine is applied with other branched chain amino acids: leucine, valine, and in the supplement complex type of BCAA, in the proportions: leucine: isoleucine: valine = 2: 1: 1. The supplements used in competitive sports requiring increased strength, the bigger share of isoleucine is used. Dosage: No standard daily use. Frequently applied directly after the workout during the decrease of the glucose level of or at fatty acid deficiency. Valine – is a branched essential amino acid, indispensible for the functioning of the nervous system (receiving of sensory information), involved in muscle protein synthesis and energy generation. Administration of additional doses of valine before exercise (or immediately after) has anti-catabolic effect, protecting the proteins and allowing them to rebuild. It is slightly stimulatory (delays symptoms of fatigue during workout), affecting the level and relations of neurotransmitters. It helps to protect the liver. It stimulates an increase in strength and muscle mass, participates in the reduction of body fat. BCAA, EAA, and other mixtures of amino acid supplementation, protein and protein supplements and carbohydrate-stacks, brings positive results in strength and endurance sports. Valine deficiency can occur in case of increased energy needs of the body, as the result of stress and too much stress load. EAA - a complex of amino acids and conditionally essential supplied with food and nutritional supplements, because it is not possible to synthesizing them intracorporeally. Essential amino acids of the EAA complex are: phenylalanine, tryptophan, valine, isoleucine, leucine, lysine, threonine and methionine, conditionally essential - histidine and arginine are necessary to ensure the accuracy of life processes involving the exchange of proteins. For the sports supplementation it is a fundamental component of a dietary supplement, supporting exercise capacity in sport strength-endurance. Depending on the chemical composition they work both catabolic and anti-catabolic. It is particularly important to supplement the EAA immediately after a heavy workout. In combination with carbohydrates they are most effective in the post-workout recovery. Threonine - essential amino acid, or synthesized from food or (and) in the form of supplements. It takes part in the production of new muscle proteins. It is essential for the proper formation of the immune system is maintained in good condition the skin, bones. It affects the normal development of the enamel of teeth and the digestive system by acting positively on the liver and gastric mucosa. It is essential to the proper functioning of the nervous system. On the Polish there are no threonine mono-preparations. Available in the form of blends of amino acids (e.g.the type of EAA) and natural protein supplements. Deficiency of threonine can cause neurological disorders and increased depression. Dosage: the lack of standards of daily demand threonine. Doses customarily used in the supplementation. Phenylalanine (essential amino acid) is provided from the outside with food or synthetic products. Its source are the high-protein foods and supplements, concentrates: protein, amino acid and nutritional supplements for athletes. Precursor of tyrosine, thyroid hormones and neurotransmitters (adrenaline, noradrenaline, dopamine), phenylethylamines (neuromodulator) and melanin pigments of hair and skin. Essential for the proper functioning of the nervous system. It has analgesic, antidepressant, and is used as an additive to supplements with thermogenic and stimulating action. It is a component of aspartame. Excess phenylalanine consumed by people with neurological problems, may reduce the availability of other essential amino acid tryptophan of nervous system and consequently lead to a reduction in serotonin and exacerbate the depression. Lysine belongs to the group of 9 essential amino acids delivered into the body from outside (with food or as a supplement) .It is a building substance of protein (the muscle protein). It is available in food of animal origin (meat, dairy products) and vegetable (legumes). It plays an important role in many physiological processes (absorption of calcium, production of enzymes, hormones and antibodies), and arginine is a component of supplements that increase the synthesis of growth hormone (HGH stimulators). In the form of hydroxylysine (a component of collagen) recommended for the treatment of sports injuries, and prevention. In the case of stress and excessive physical and psychological overloads, it is recommended due to the function of lowering cortisol levels. Also it applies in medicine, in the treatment of anxiety and herpes. The share of lysine intake of daily doses of amino acids should not exceed 5.1%. Available for purchase at www.muscle-zone.pl. In the processes of digestion of protein matter, as a result of decarboxylation of lysine, may be converted into cadaverine (biogenic amine) having a strong toxicity. Dosage: the lack of a well-defined standard daily intake of lysine. The supplementation dosages regularly used: with arginine 500 mg - 2g (before bedtime) pre- and post-workout optionally with other amino acids. Histidine is one of the 22 amino acids being part of protein - depending on the source of information it is referred to as "relatively exogenous" or "exogenous". The required dosage of this amino acid is very small, and at the same time it should be added that the intestinal microflora can also play a role in meeting the demand for it. Histidine is a precursor of carnosine, and therefore dipeptide having antioxidant and buffering qualities. Increasing the dose of carnosine in muscles is an effective way to increase strength and endurance, as well as to accelerate recovery after exercise, thus improving the indicators that are extremely important especially in the case of people being engaged in regular physical activity , including professional athletes. The number of products containing histidine and available on the market is quite limited. This amino acid is mainly added to some of the supplements used before and/or after exercise, as well as to some of the amino acid supplements. It should be noted, however, that it also occurs naturally in foods rich in protein, and thus primarily in meat, eggs and dairy products, as well as in protein supplements. Histidine is an amino acid which can be converted in the body into glucose. It also takes part in the synthesis of proteins, including hemoglobin. Dosage: There are no precise data, but as it has already been hinted above - the required dosage of this amino acid is very small.